Commissioned by the John Clark Motor Group, a new Audi showroom will be the latest addition to add to their Portfolio of state of the art Showrooms within Aberdeen and the immediate vicinity. 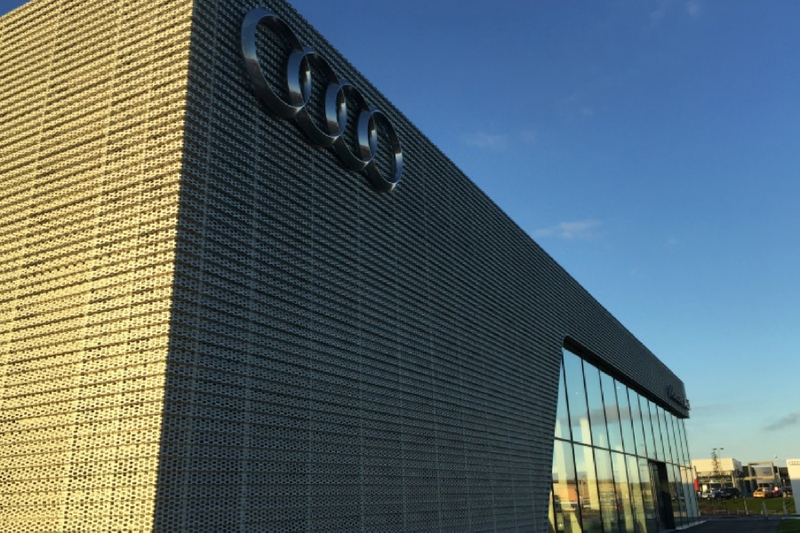 The development provides a new showroom designed to Audi Brand Standards along with a high end ‘Workshop’ building, separate ‘Used Car Pod’ building and a ‘Valet Bay’ building. The development is aimed at providing a complete high end service for the customer. The main building within the development consisted of two parts; a new Showroom fronting on to Wellington Road and a Workshop to the rear. The structure is comprised of a steel frame with shallow pitched roof trusses and is supported by pad foundations. The showroom also provides office space to the upper level with a composite concrete in-situ mezzanine floor and sloping columns. The main Showroom Elevations boast extensive glazed elevations which demand an innovative approach to the steel design.